A Grand Adventure to the Grand Canyon! Everyone told us, when they found out that we were driving to Los Angeles, that we HAD to stop at the Grand Canyon on the way. My parents only saw it for the first time just last year! So, it would be an incredible memory to share with my son as I am anticipating that this trip will mark the end of significant time that we spend together. As I looked at the map trying to keep my driving days relatively short, I just could not find a way to do it. We could skip it and go directly to Las Vegas from Boulder, CO, but then we would miss it and who knows when I’ll see it or when he would see it. I kept feeling confused about the whole, “It’s on the way” thing people kept saying. When I looked on the map, I was expecting to see a road that ran along the Canyon to Las Vegas because it was “on the way”. I didn’t see that road on the map, but you know electronic maps don’t have everything on them! It was going to be about a 12 hour drive to the Grand Canyon. We were planning a stop in Nederland, CO so Pierce could skate on a park that was designed by Tony Hawk. This little town in the middle of the CO Rockies won a grant for this park. It was on the way, so we’d do it. This trip was for Pierce first, everything else took 2nd to him skating on as many skate parks as he could on our way to Los Angeles. In Los Angeles, he is going to school with the goal of designing skate shoes and becoming a pro skateboarder. I encourage him in his own dreams and pursue mine along the way. This is the first time in my life that I have given myself permission to do it. I cannot tell you how long we drove that day. I think we left Boulder by 10am and we stopped for gas and food and to stretch along the way. And, most importantly, take pictures. The scenery was absolutely stunning! I even took a lot of pictures right from the car because I didn’t have time to stop. Colorado was beautiful and what I saw of Utah was beautiful. I don’t like driving in the dark just because I know I am missing some beautiful landscape. When we finally got off the main highway and were on what should have been the last stretch to the Grand Canyon, we came upon an accident. A truck had overturned and this was on a road that was one lane each direction. It hadn’t happened too long before we arrived and the emergency workers told us that it would be at least an hour before the accident was off the road and we could get by. It was late enough that we could have slept a little while in the car right there, but we were still raring to go and we could go around a mountain on the highway and take another way. This would add a couple hours, but we thought it was better than sitting still. As we got back onto the highway, there were signs saying, “thick smoke may cover roadway” and we weren’t sure what that was about at first. 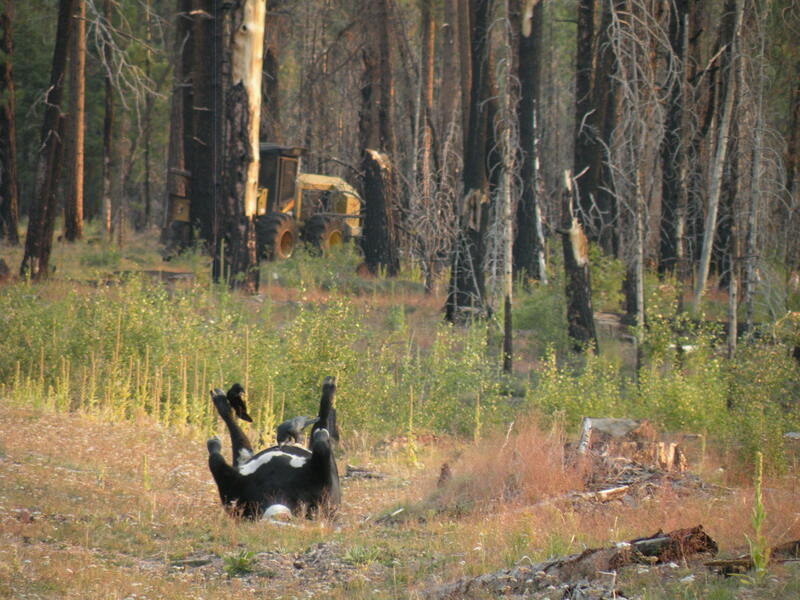 Then, there were signs that there was a forest fire and not to call to report it. We could smell it, like a campfire nearby. Then we began to see clouds overhead that were glowing red. As we rounded the mountain, we could see it. I have never seen anything like it up close. What I have seen on TV that looked like what I was seeing for the first time in person was a volcano erupting, without lava flowing down into the road. 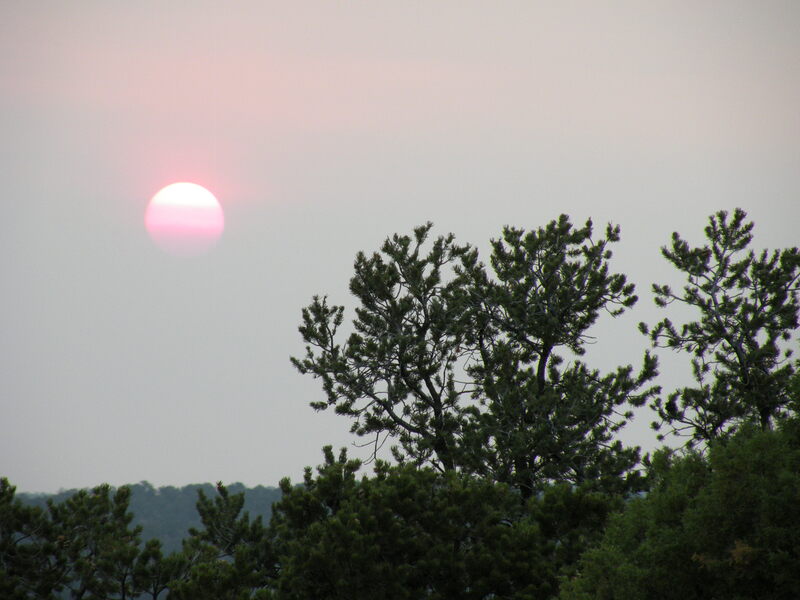 The mountain glowed red like lava with black patches between the red flames. We couldn’t tell how high the flames were since there was a cloud of smoke sitting above the mountain reflecting the red flames. Even the full moon seemed to be hovering above the fire and it also reflected the red from the flames. The smell lasted almost as far as we drove that night. We drove and drove and finally stopped along the road to nap. Later, we drove more and I couldn’t go any farther when we were in the desert. We pulled over around 2am and slept til 6am, when the first car came by. It was the first sunrise I have been awake for in a very long time. Now I have sunrise pictures as well as sunset pictures! It was beautiful! And a beautiful drive in to the Grand Canyon. Yet, there were quite a few scenes we weren’t expecting. What we were expecting was a drive through a desert to a big hole in the ground, more or less. We went through the desert, then, we entered a forest. It wasn’t all that different from a forest in Pennsylvania or Colorado. There were lots of Aspen trees turning golden. Then we began to see signs. They had pictures of cows on them like it was a marked cow crossing. We didn’t know and still don’t know why there are cows in the forest at the Grand Canyon National Park. 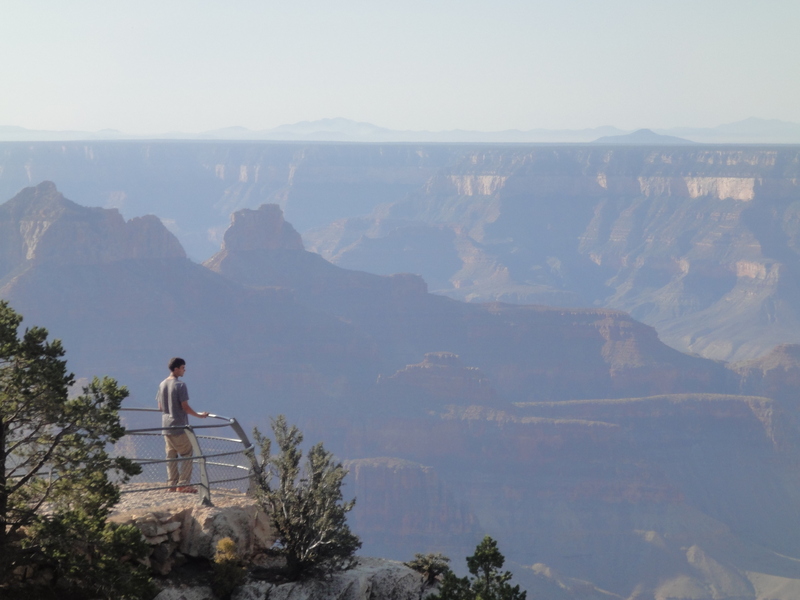 In case you haven’t seen what we have seen, we were on the much less visited North Rim. We actually did see cows at some point in time. And we saw a bull! But, the most unusual cow we saw was a dead cow along the side of the road. Its legs were straight up in the air with birds on them. What an amazing sight! More amazing than the purple cow I saw at the Farm Show when I was a kid. 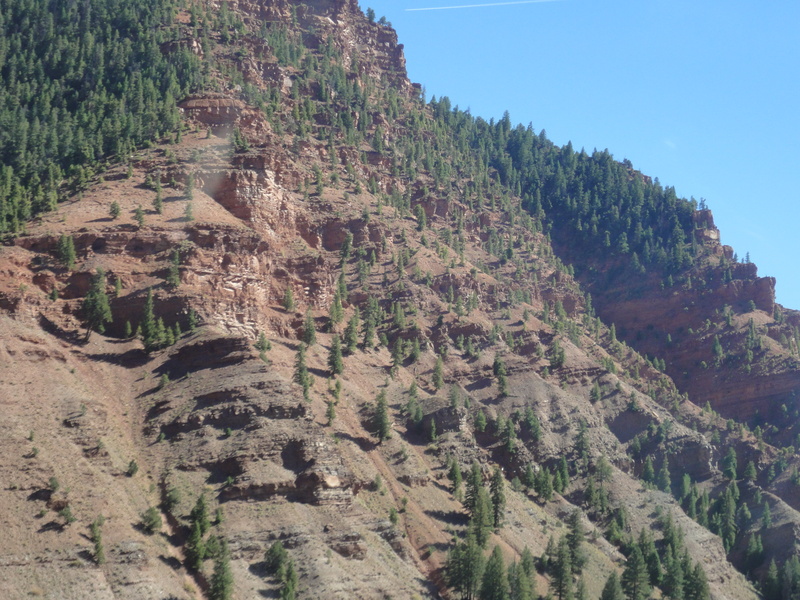 As we drove up hill, we could catch glimpses from time to time of the Canyon. When we finally arrived at a parking lot which seemed to be as far as we could drive, we had no idea how far from the Canyon we were. We heard we had to hike the rest of the way. Fortunately, the rest of the way wasn’t too far. But the trees went all the way to the edge. There was a trail around the edge and a couple places where you could walk out onto rocks and look over the edge. It was so very obvious that if you slipped off the trail and weren’t able to catch your fall, it was a long way down. The trails weren’t lined with railings. We were exhausted and Pierce did the Chevy Chase thing from his Vacation movie. Looked over the edge and said, “Ok, let’s go!” Well, I had too many pictures to take. We stopped at 2 of the three major overlooks and some smaller ones on the way and spent about 4 hours there, then left for Vegas. There was no road “on the way”. We had to travel 2 hours out on the same road that we came in on, then around to Vegas. It was only 6 hours and I can’t regret seeing the Grand Canyon. I am just oh so very happy that I didn’t have to sleep in my car more than 1 night!